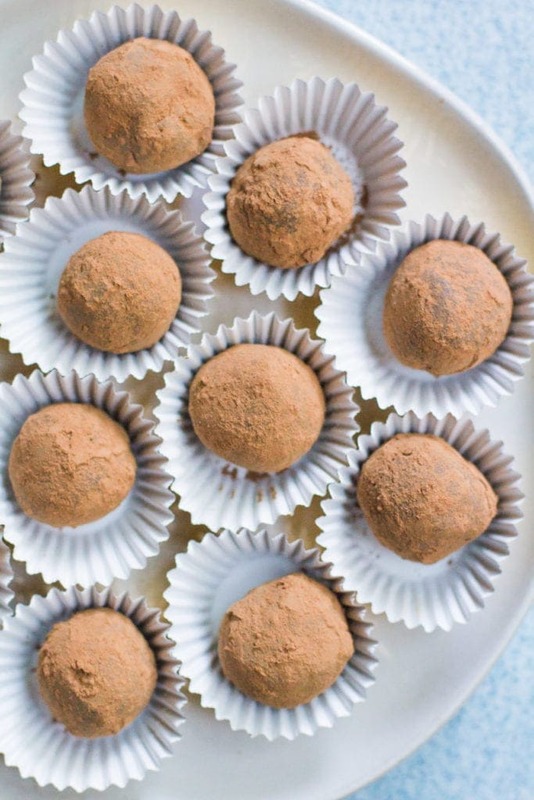 Healthy Chocolate Truffles are the ultimate paleo and vegan dessert. Made with only 6 ingredients and easy to make – they’re perfect for a healthy treat! 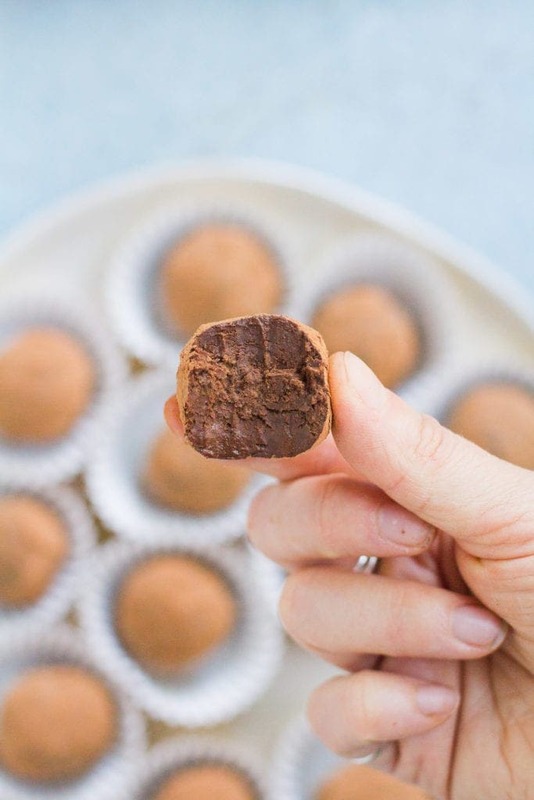 These Healthy Chocolate Truffles are everything my friends!! 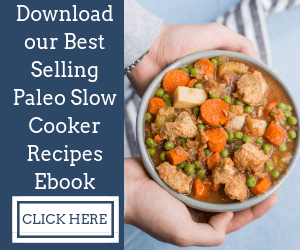 Paleo, gluten free, vegan and SO delicious. 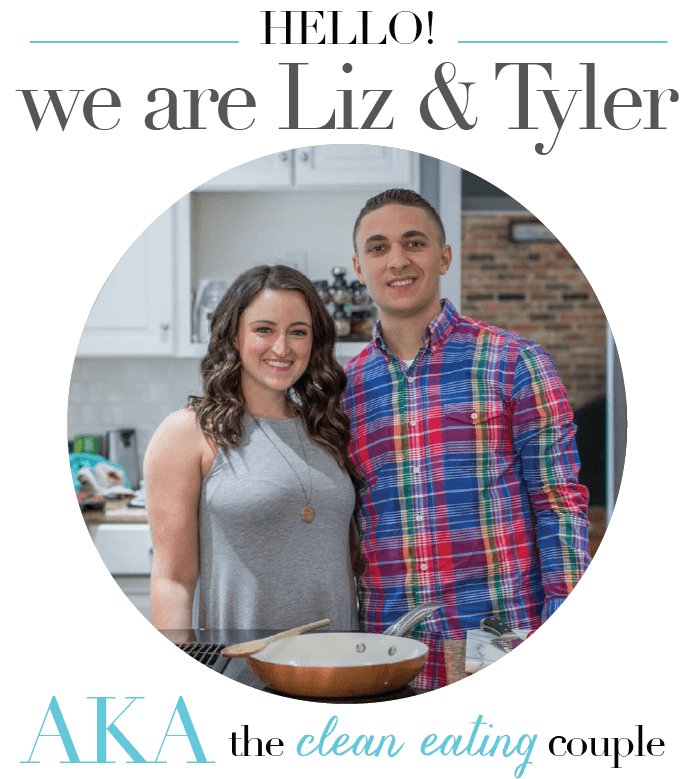 You will LOVE them. 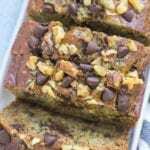 Ridiculously simple to make, these treats are great for gifting to friends or just keeping in the fridge for when you’re craving something sweet! I’ve said this before- but when I started to eat healthier, chocolate was the one thing I refused to give up. 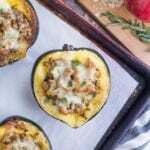 It’s not that I can’t live without it (although I’ve tried – hello, whole30), it’s that I don’t want to!! The base of good healthy chocolate truffles is a delicious chocolate like this one. Along with a few other simple ingredients like avocado, coconut sugar and vanilla extract. 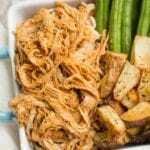 They’re super simple to make – see below! 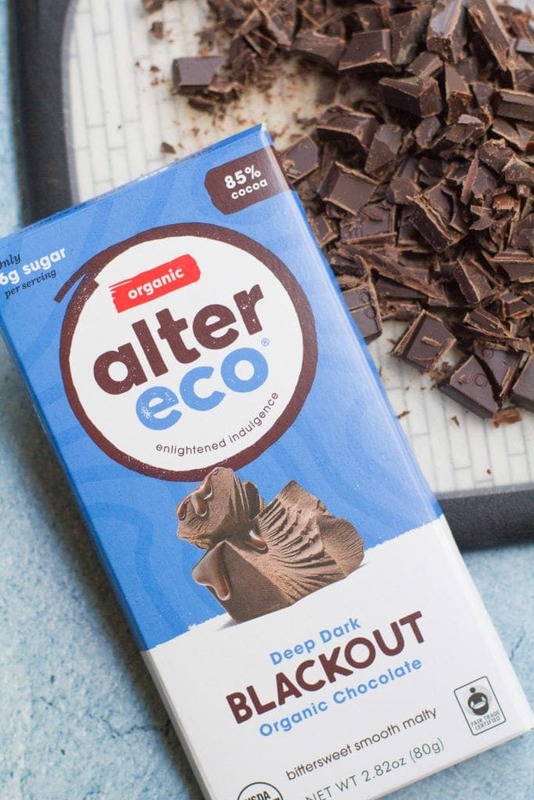 Use a chocolate with no dairy + minimal sugar. This is the one I like. Use a food processor – I find this is easier to do in a food processor than a blender, but you can use a blender too! 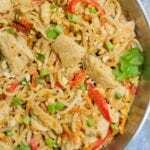 This food processor is one of my favorite kitchen tools! 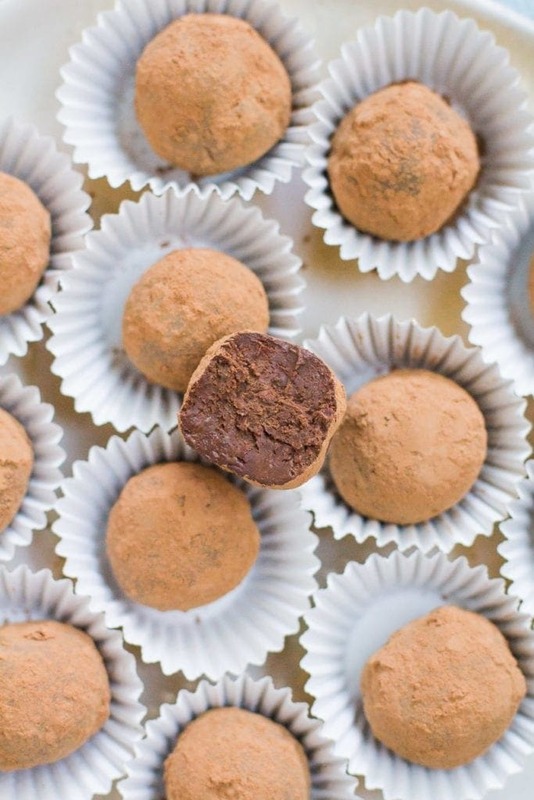 What makes these chocolate truffles healthy? 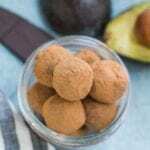 Healthy Fats – These truffles use avocado instead of heavy cream or other dairy products to give them richness. Low Sugar– Most chocolate truffles are high in sugar and can be super sweet. 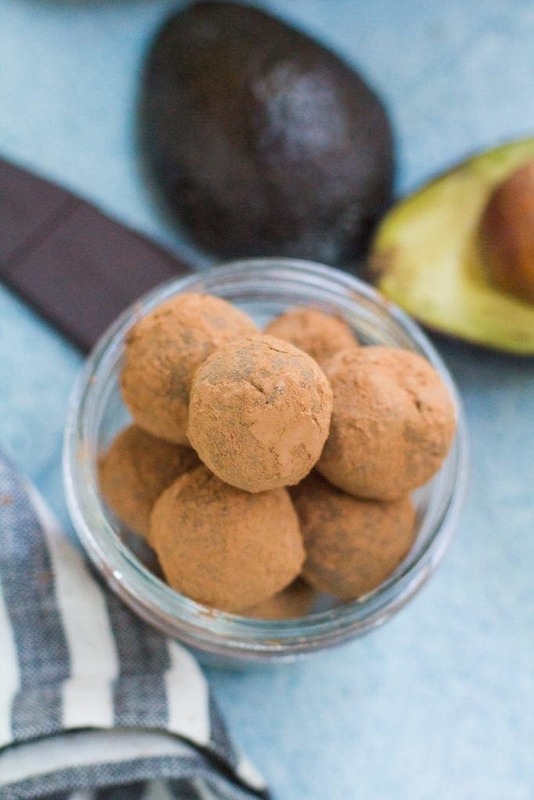 These truffles have minimal sugar and focus on the flavor of the chocolate + the richness from the avocado! 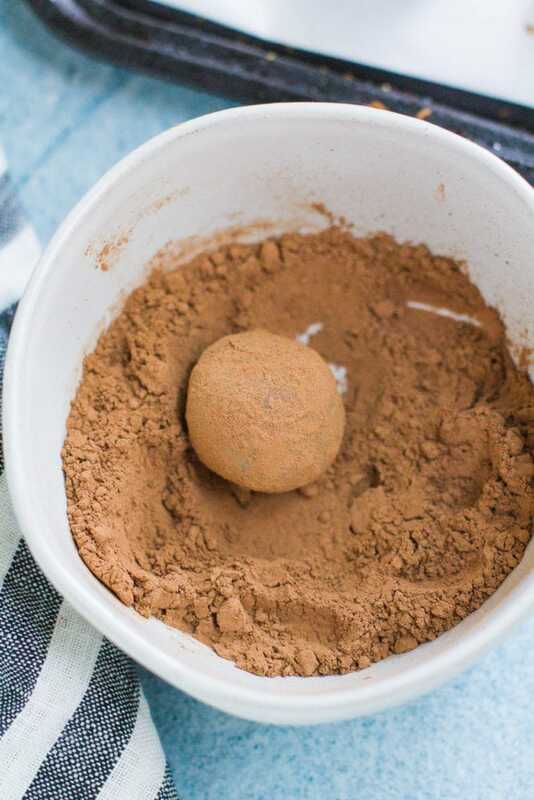 Minimal ingredients– These truffles are only made with 5 ingredients! Check the ingredients on anything you find at the store – I guarantee it won’t say that!! Vanilla Extract– Vanilla extract isn’t necessary in the truffles, you can omit if you don’t have it! You can store these healthy chocolate truffles in an airtight container in the refrigerator for up to one week. I would not recommend freezing them. 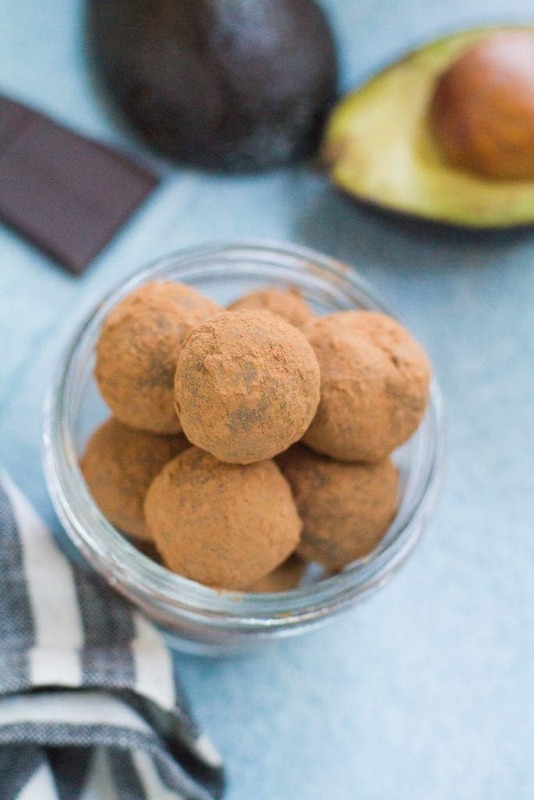 Healthy Chocolate Truffles are the ultimate paleo and vegan dessert. Made with only 6 ingredients and easy to make - they're perfect for a healthy treat! Puree the avocado in a food processor or blender until smooth. 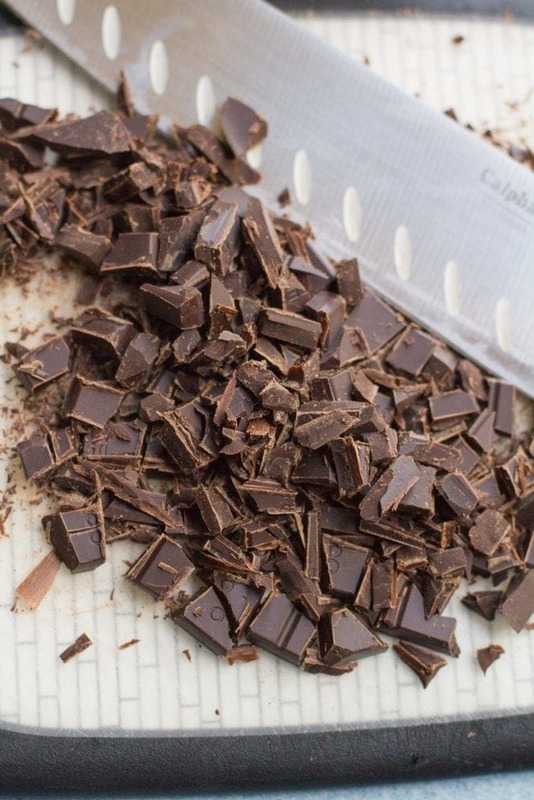 In a separate bowl melt the chopped dark chocolate. Be careful not to burn the chocolate, you can stir it every 20 seconds. When chocolate is completely melted, stir in the coconut sugar and vanilla. Whisk until dissolved/combined. 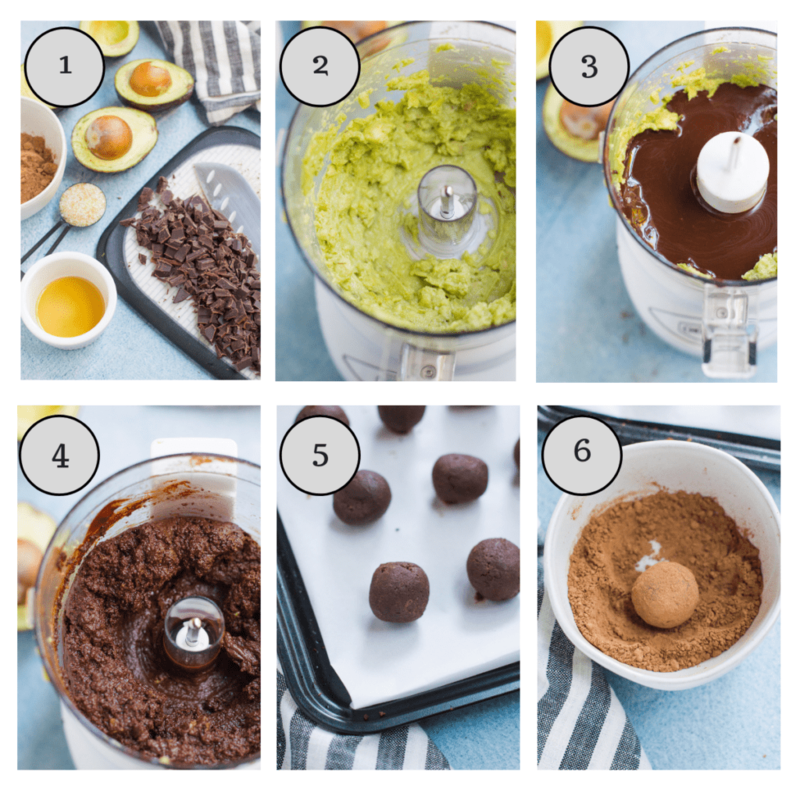 Pour chocolate mixture into food processor with pureed avocado and pulse again to combine. Put in the fridge for about 20-30 minutes to cool and set aside small bowl of cocoa powder. Once truffles have cooled, roll the truffles into small balls. Lightly dust in cocoa powder. Keep the truffles in the refrigerator for up to one week. Use a food processor - I find this is easier to do in a food processor than a blender, but you can use a blender too! 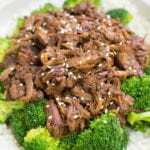 This food processor is one of my favorite kitchen tools! Vanilla Extract- Vanilla extract isn't necessary in the truffles, you can omit if you don't have it! 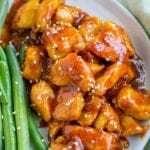 Wow these look so easy! I’ve been craving something like this all week. Thanks, friend!! They’re seriously delicious! LOL! Thank you Lori!! 🙂 They are SO yummy! These are SO good! 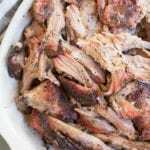 I made them last year during the holidays and made them again this year – absolutely delicious! Hi Joanie! That makes me so happy! I’m glad you like them! !